After public tendering the originally British company Arriva won not only a majority of the local passenger rail traffic but also a large number of bus routes especially in northeastern Netherlands. The majority stake of Arriva was later bought by the German Deutsche Bahn and today Arriva is a daughter company of DB. 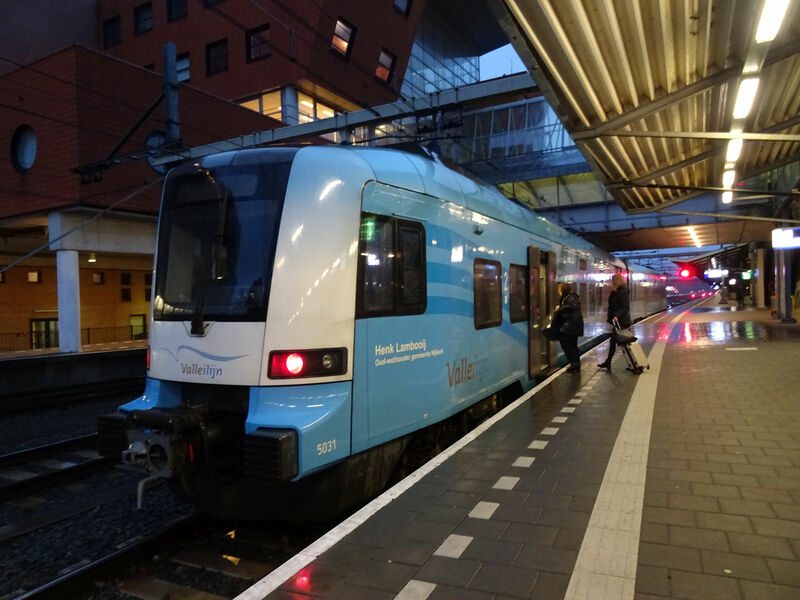 Around the city of Groningen, Arriva handles all local train traffic with its local trains trademarked as "Spurt". Technically Arriva uses new two and three coach railbuses of the types Stadler GTW 2/6 and GTW 2/8. 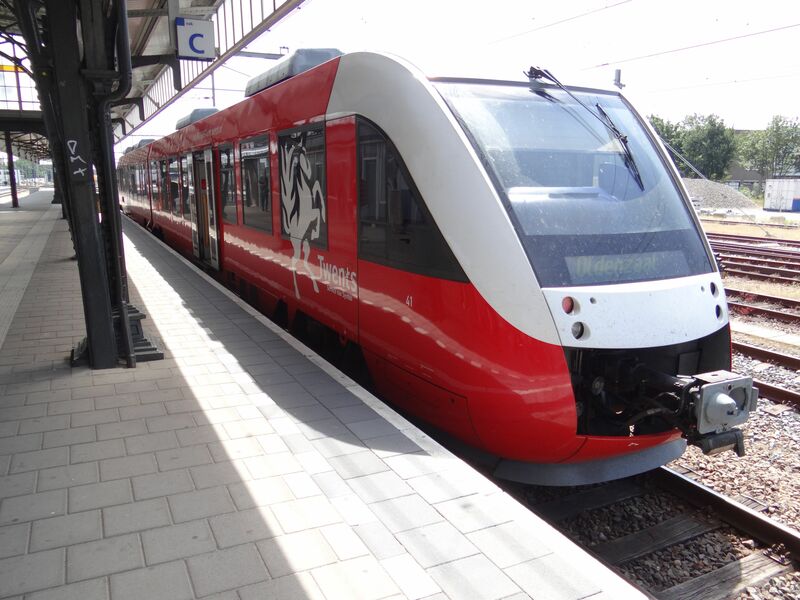 Stadler is a Swiss company and the notation stands for Gelenktriebwagen (articulated multiple unit). 2/6 means that the train has six axles out of which two are powered. The GTW trains have in the middle a compact "power pack", like a small extra coach, which contains the engines and the powered axles. The reasoning behind this design was to avoid putting heavy items on the roofs of the coaches, as is customary in the case of low-floor trams. This design proved to be a success. 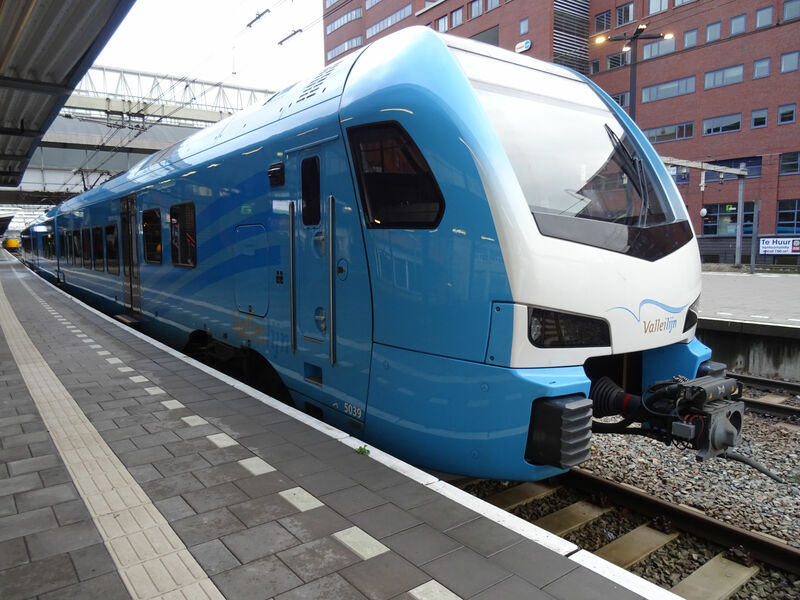 These Arriva Spurt GTW trains are already of the third generation of Stadler GTW trains and many more have been delivered ever since. Picture of an Arriva "Spurt" GTW 2/6 at the Groningen station 21.3.2011 by Ilkka Siissalo. 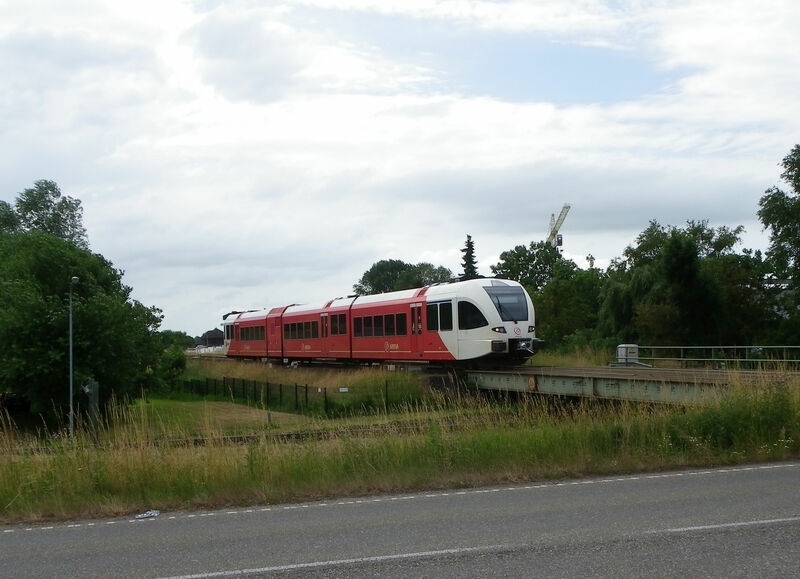 A three coaches long Stadler GTW 2/8 as an Arriva Spurt is crossing a small canal near Zuidbroek in the province of Groningen. Picture 5.7.2010 by Ilkka Siissalo. 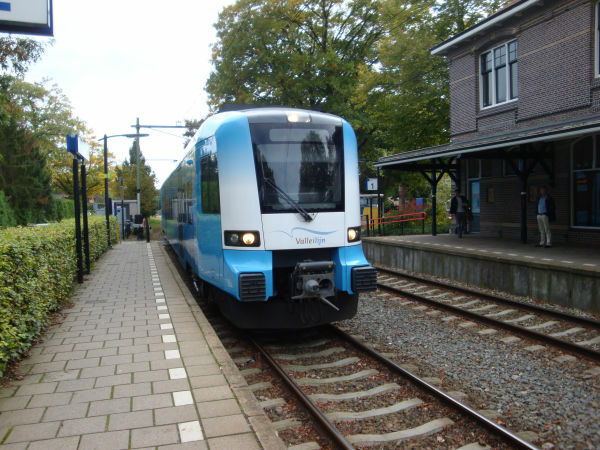 Same train as in the picture above, here braking to stop at the station of Zuidbroek, east of Groningen. When Arriva won in a public tendering all the local train traffic and also much of the local bus traffic in northeastern Netherlands, they ordered new trains from Stadler, but it took a long time to get them. In the meantime Arriva leased from NS old trains, the same ones that had for years already been operating on the same routes. Arriva operated first as a daughter company called NoordNed (full name NoordNed Personenvervoer B.V.). 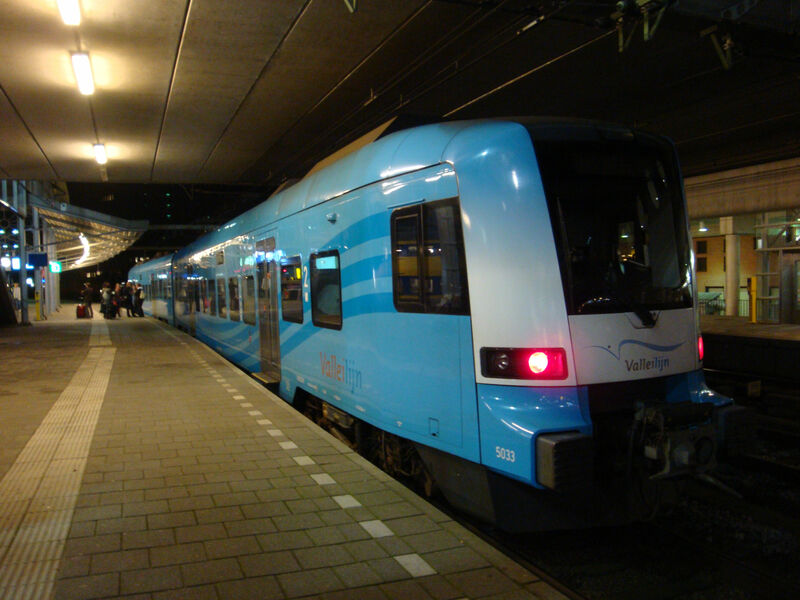 Since December 2005 the name NoordNed has not been used any more and NoordNed as a company was fused into Arriva Nederland. NoordNed even painted some of these trains and also local buses in its own light green colours before the company name and colours were abandoned. 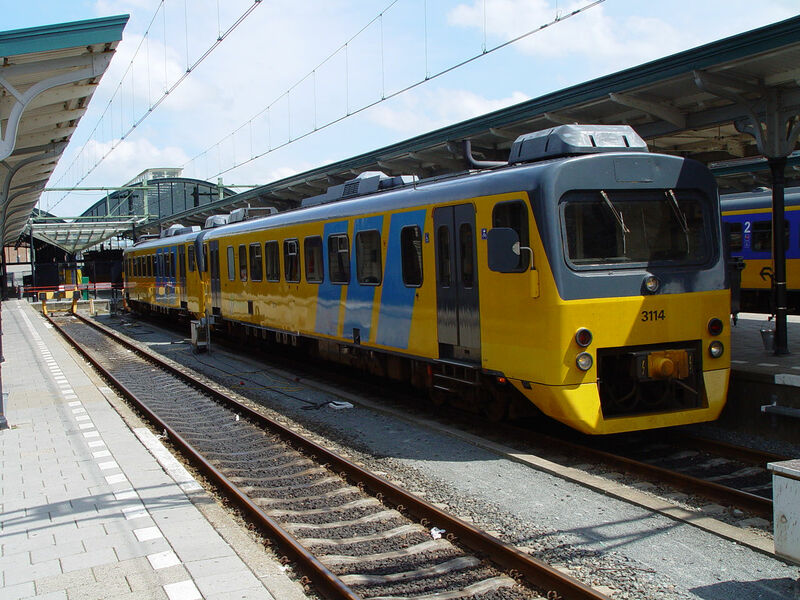 These are two of the so called Wadloper railbuses, still in NS' colours, but with NoordNed stickers on their sides. The railbuses were officially called DH1 (one coach version) and DH2 (two coach version), but they were better known as Wadlopers, the two coach version also as Wadkickers. Wadloper means somebody who runs on the wet and muddy marshlands of which there are so plenty in northeastern Netherlands, in the province of Groningen. The Wadlopers were built by a consortium of Düwag, Cummins, Voith and SIG but Düwag of Düsseldorf, Germany was the main manufacturer. These one coach DH1 Wadlopers date back to 1983 and the two coach variant DH2 was built 1981-82. 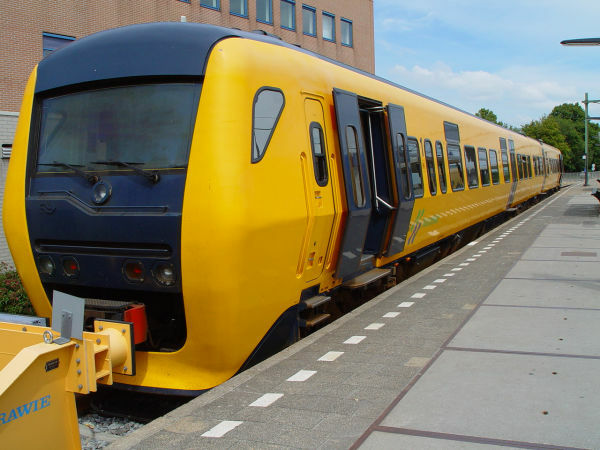 There are none of these trains left in the Netherlands any more. 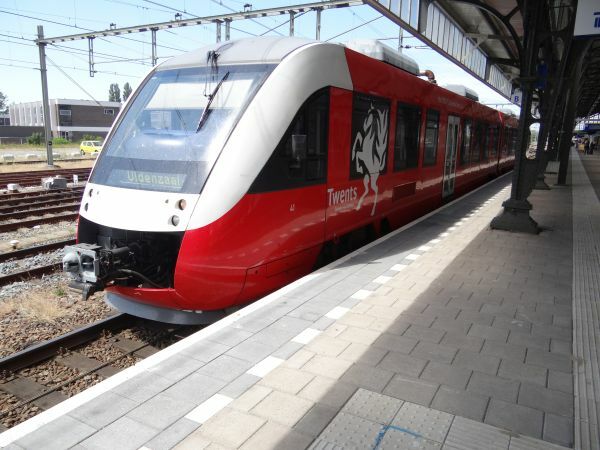 They have been sold to Poland (both to the state railways subsidiary Przewozy Regionalne, now Polregio, and to Koleje Mazowiecke), to Q-rail of Czech republic, to Trenes de Buenos Aires in Argentina and to the train operator TFC in Romania. At least in Buenos Aires and in Romania they are still used. Picture from the station of Leeuwaarden in the province of Groningen 7.7.2004 by Ilkka Siissalo. This train is here ready to leave as a "Sneltrein" or express train to Groningen from the town of Leeuwaarden. The train is a DM90 (meaning dieselmaterieel -90, diesel train from 1990). These trains were built by Talbot based on a licence from Düwag. It is technically practically identical with the German railbus class Br628, just looks a bit more modern. There were 53 of them and they were built 1996-98. The first ones were taken out of use already in 2010 and the last ones in 2017. It was a 140 km/h fast dieselhydraulic railbus. It was technically possible to use these trains together with the Wadlopers, but then the maximum speed used had to be adjusted to the top speed of the older Wadlopers, 100 km/h. Their nickname was "Buffel", buffalo. Note the "NoordNed" stickers to the right of the open door. This individual "Buffel" was built by Talbot as their factory no.2446 in 1997. 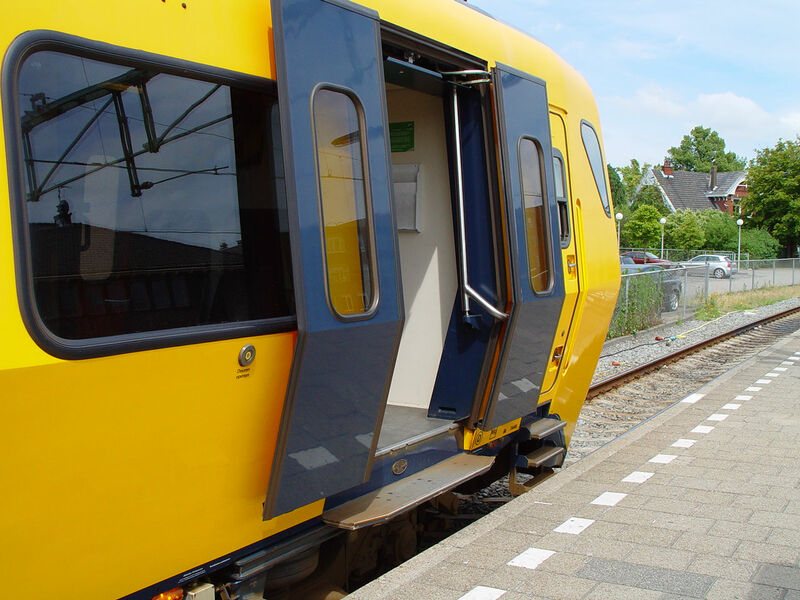 Same train as above; here the outswinging doors of the DM90 "Buffel". These trains were also used based on a leasing agreement by the company Syntus, see below. In 2017 all the remaining "Buffel" trains were sold to Romania. 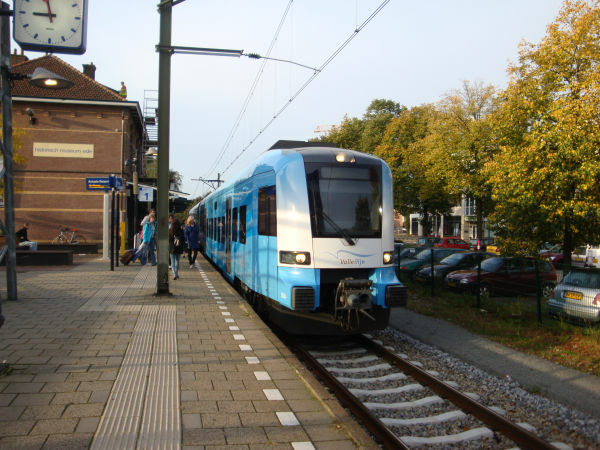 The Valleilijn is a public transport system between the city of Amersfoort and Wageningen, consisting of a bus system between Wageningen and the Ede-Wageningen train station and the train line formerly called Kippenlijn between Ede-Wageningen and Amersfoort. The company Connexxion won in 2006 in a public tendering the right to operate the whole Valleilijn for 15 years. In order to do so, they bought these trains called Protos. They are built by Fahrzeugtechnik Dessau. The trains were taken in use in 2007. A two coach train weighs 108 tons, has a maximum speed of 160 km/h and has 16 first class and 154 2nd class seats. Power rating is 1340 kW. Connexxion has five of them. 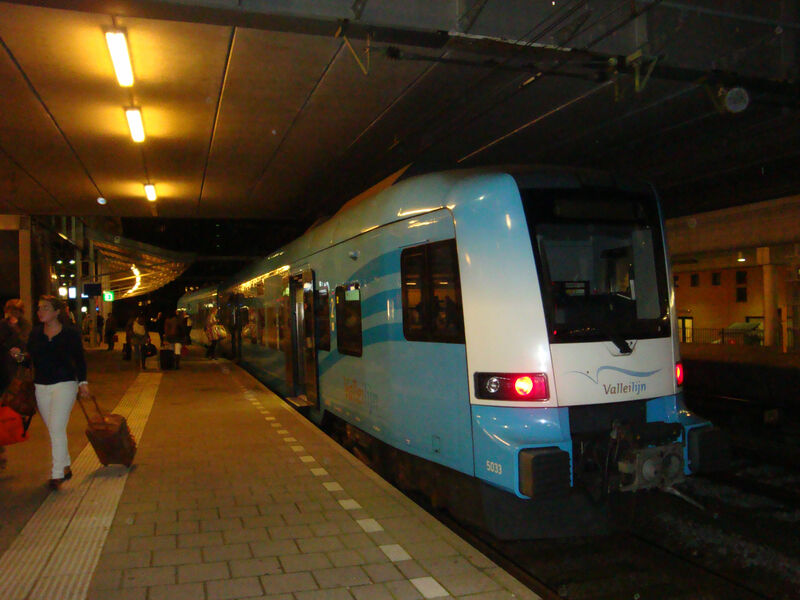 Here we see one of the Protos trains late at night on Amersfoort station 3.10.2010. Another view of the Protos train no 5033. Connexxion numbered its five units for some reason 5031 to 5035. Picture from Amersfoort station 3.10.2010 by Sanna Siissalo. 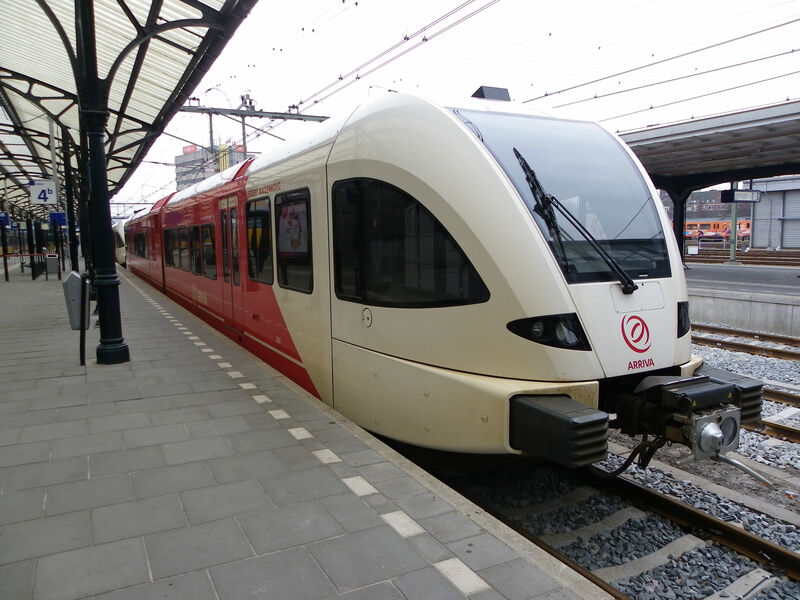 Another Protos train no 5034 now at the other end of the line, at the Ede-Wageningen station. In 2018 when Connexxion needed two more train units, they bought two FLIRT trains from the Swiss company Stadler instead of these Protos trains. The Protoses were never a commercial success. Picture from Ede-Wageningen 4.10.2010 by Sanna Siissalo. Another view of the same Protos unit no 5034. 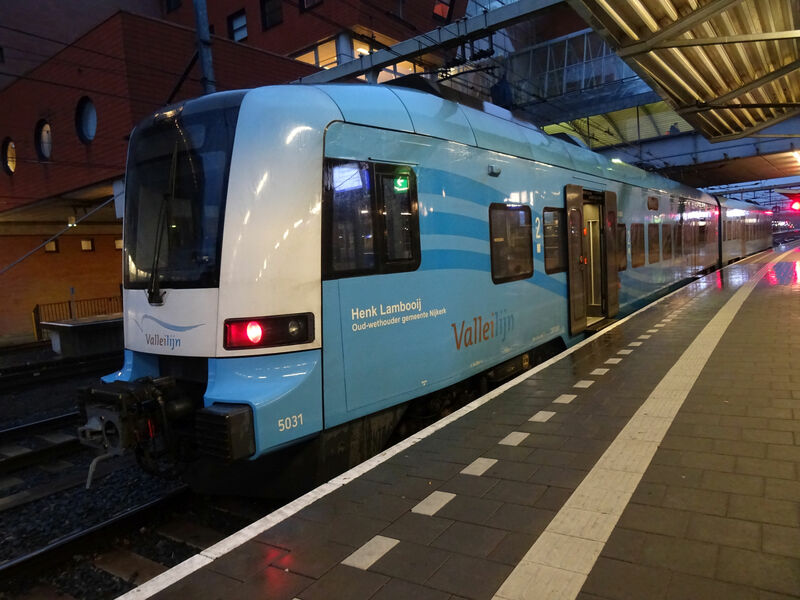 Yet another picture of a Valleilijn Protos train. Picture from Amersfoort 7.12.2018 by Sanna Siissalo. The same Protos train as shown above. This no. 5031 "Henk Lambooij" is the very first Protos of Connexxion. A couple of years after Connexxion had won the Valleilijn traffic for itself, the company needed two more trains. But at that time Protos trains were no longer an option, the small German manufacturer had in the meantime died away. As a result, Connexxions two newest trains are Stadler Flirt 3s. Picture from Amersfoort 8.12.2018 by Sanna Siissalo. A second view of a Connexxion Valleilijn Flirt 3. 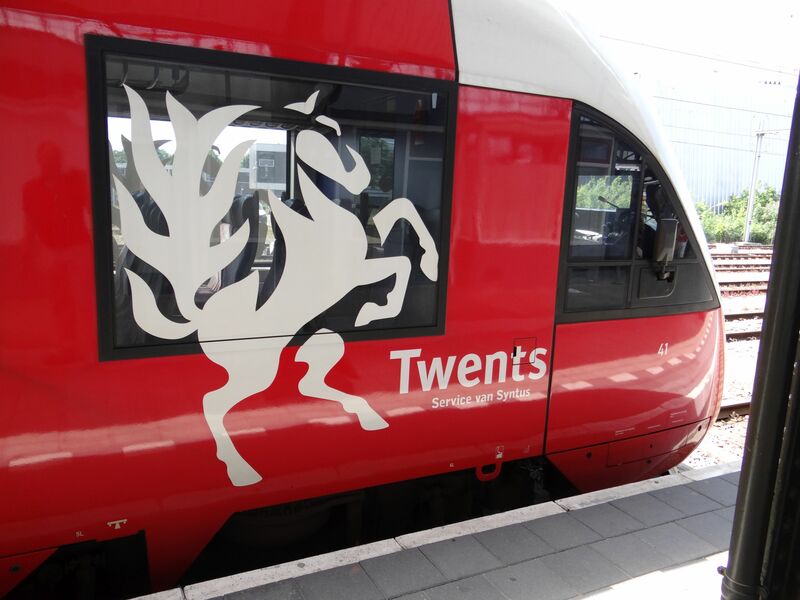 In the eastern part of the Netherlands, close to the German border, the company Syntus is running local trains around Twente with the tradename Twents. This is a Twents train. It is a LINT railbus built by Alstom, here running a service from Hengelo to Enschede, or in this case just to Oldenzaal, as the track between Oldenzaal and Enschede was under reparation work. 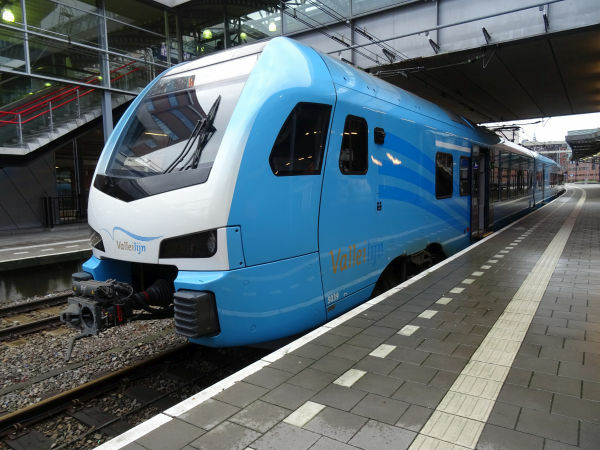 The new name of the company Syntus is now Keolis Nederland and Keolis is a private French company. 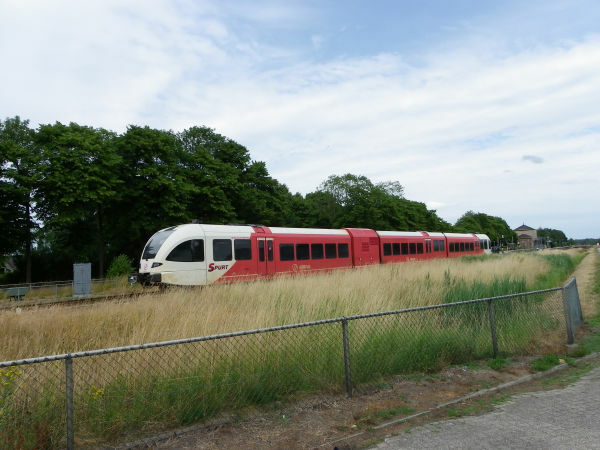 Picture from Hengelo station 11.7.2015 by Ilkka Siissalo. Same train as above, but seen from the other side. Side logo of the same train as above.